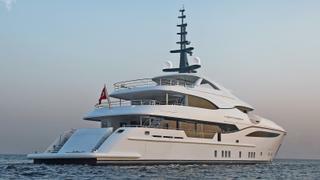 Turkish yard Bilgin Yachts has launched the first in its new 47.5 metre Bilgin 156 semi-custom series, which has been named Nerissa. One of three yachts currently under development at Bilgin, Nerissa will now undergo sea trials before heading to the South of France to make her public debut at the 2017 Monaco Yacht Show. The exterior and naval architecture was completed by Unique Yacht Design. 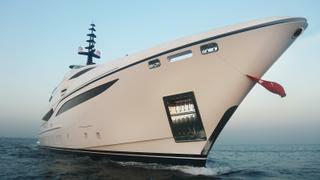 Comprised of a steel full displacement hull and aluminium superstructure, she features a total interior volume of 496GT. Nerissa is powered by twin 1,475hp MTU 12V2000 M72 diesel engines and is expected to have a top speed of 16 knots and a maximum range in excess of 4,000 nautical miles at her cruising speed of 12 knots. The interior and general arrangement was developed by H2 Yacht Design, who created a generous owner’s suite with a fold-out balcony. She has five cabins in total — including two VIP cabins and two guest cabins — and can accommodate up to 12 guests. The interior style is described as highly modern, bright and featuring large windows. She has a copper colour scheme that is complemented by subtle touches such as the introduction of wood variants and precious metals. The second hull in the Bilgin 156 series is already being built on speculation and is due for completion before the end of the year. 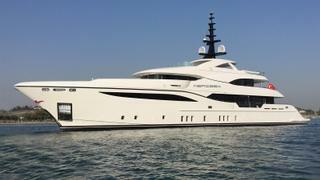 This superyacht will vary from Nerissa in having a convertible superyacht helipad on the upper deck aft section. Also in build at Bilgin is the Bilgin 263, the yard’s largest ever yacht, which was sold to a repeat client in October 2015.